More appetizers. Yum! This appetizer has so many favorites. Always a winner when serving. I don’t know of anyone who wouldn’t like this. 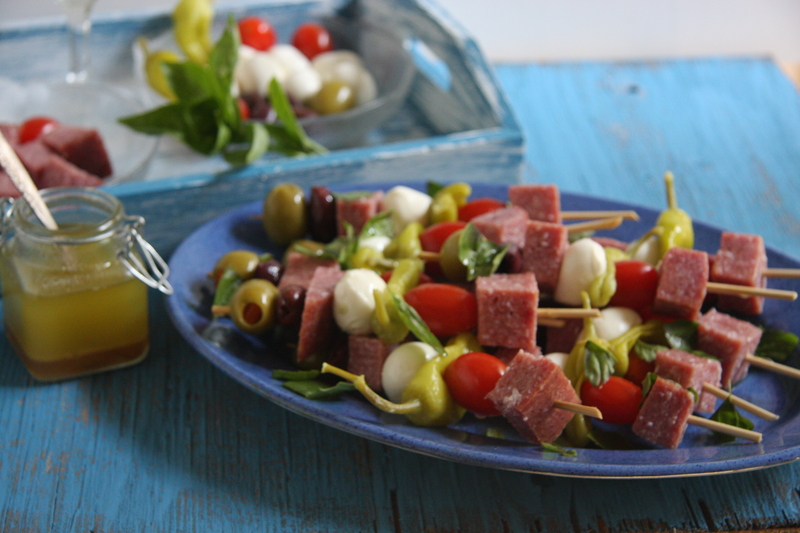 Salami, cheese, olives, tomatoes. This is pizza on a stick, without the bread. I love this combination on a pizza so why not on a stick. So quick and easy to make. Make it in advance and keep it in the fridge, pop them on a tray and your ready for your guests. You need 1/2 lb. of salami cut into cubes. Along with 12 large stuffed green olives, 12 pitted olives, a container of cherry tomatoes, about 24 bocconccini and a bunch of sticks. I would recommend getting extra ingredients, in case you want to make more or to be safe and have enough to make what you need it for. 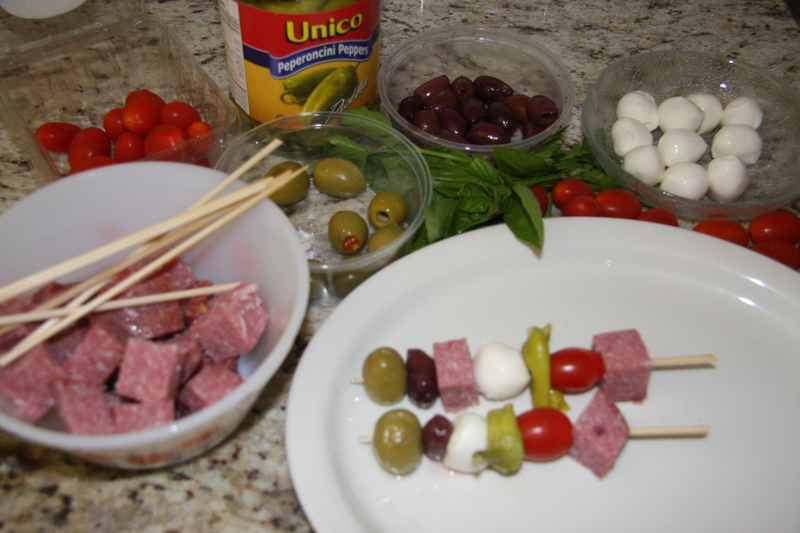 Take your ingredients and place them on a stick in a pattern you like. In a container mix the dressing and sprinkle it over the sticks when they are done. The other option is to make 3 to 4 times more dressing and before putting the ingredients on the sticks marinade the ingredients in a container, place them in the fridge and after a couple of hours put them on the sticks and serve. The second option is the better choice. That way all the ingredients get coated. It is always a good idea to have extra ingredients. So you don’t run out of something when making the sticks. At the end when your sticks are on the serving platter, sprinkle with torn basil leaves.